A delicious tea time treat made with homemade custard. A tantalising teatime treat, our homemade egg custard tart is made by combining egg, creamy milk, a little sugar and a grating of nutmeg. We then pour this lovely mixture into sweet shortcrust pastry case and bake to perfection. One tart is a large single serving that goes well with a nice cup of tea. Please note that this product is shipped out chilled. We do not recommend freezing or reheating. Custard tarts were delicious, as is everything I've ever ordered from here. These are the best pies! Even better than the ones we had in England. 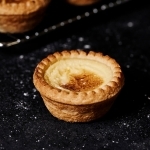 The English Pork Pie Company offers the only authentic English egg custard tarts available to all. The custard filling is spot on. The only negative is the custard-to-crust ratio, which is a bit low for my taste. Still, overall it's the best I've found anywhere. I adore the custard tarts. Perfect mix of eggy deliciousness, buttery and flaky crust, and a dash of sweetness that is subtle and piquant. very good custard tarts.. loved them. Just like granny used to make over 'ome. A lovely treat ... really, really good.